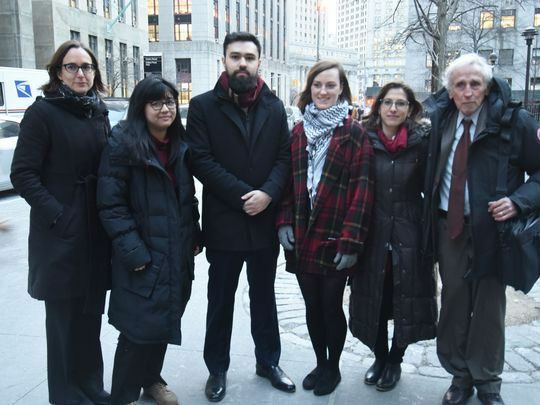 January 3, New York, NY – On Wednesday, Fordham students denied permission by their university to start a Students for Justice in Palestine (SJP) club argued their case before a Manhattan judge. The students, represented by the Center for Constitutional Rights (CCR), Palestine Legal, and cooperating counsel Alan Levine who argued in court today, first filed suit in April, and Fordham moved to dismiss the case. In November, the students filed a motion for a preliminary injunction asking the court to direct Fordham to recognize SJP now, since some of the students will soon graduate. In court Wednesday, the students defended this motion and argued against Fordham’s motion to dismiss the lawsuit as a whole. Fordham’s decision to fight the lawsuit rather than correct course suggests it is entrenched in its censorship of Palestine advocacy on campus. The students asked the court to order Fordham to reinstate the student government’s approval of SJP before a final decision on the merits of the case is reached. Otherwise, petitioner Sofia Dadap and petitioner Julie Norris will likely graduate before the court makes a determination, depriving them of the opportunity to advocate for Palestine as SJP at Fordham. Without club status, students cannot invite guest speakers, reserve meeting space, distribute or post materials, or solicit members through club fairs. Students filed their reply to the university’s opposition to their preliminary injunction on December 22, arguing that Fordham has deprived them of their freedom to advocate for causes in which they believe without arbitrary censorship by college officials, a right guaranteed by Fordham’s own policies. On the merits of the case, the students argued that the Fordham administration’s veto of the student government’s approval of SJP was arbitrary and capricious, violating its own policies guaranteeing free expression and relying on unfounded justifications. Fordham attempted to justify its decision by asserting that the purpose of SJP, which is to promote justice and human rights for Palestinians, leads to polarization, and because of reports that some separate SJP groups on other campuses have engaged in disruptive activities, without regard for whether those reports were accurate, or the fact that SJP groups operate independently. Fordham disregarded evidence that countered university officials’ stated concerns about SJP, instead basing its decision on materials from individuals hostile to SJP’s views. Palestine Legal and CCR have documented “the Palestine Exception” to free speech, the broad and growing pattern of suppression of Palestinian human rights activism across the United States, particularly on campuses. Tactics used to suppress Palestine advocacy include administrative disciplinary actions, harassment, firings, baseless legal complaints, legislative attacks, and false accusations of terrorism and antisemitism. Palestine Legal responded to 650 such incidents of suppression targeting speech supportive of Palestinian rights from 2014 to 2016. For more information, visit CCR and Palestine Legal’s case pages. Palestine Legal is an independent organization dedicated to protecting the civil and constitutional rights of people in the US who speak out for Palestinian freedom. Our mission is to bolster the Palestine solidarity movement by challenging efforts to threaten, harass and legally bully activists into silence and inaction. Visit www.palestinelegal.org and follow @pal_legal.